Style savants, 2014 is coming. It seems like just yesterday we were all shaking in our Saint Laurent boots, fearing the rumored Apocalypse. Over a year since December 21st, 2012, and I'm happy to report that the world is still turning. As many fashionistas (and fashionistos) know, trends come and go; however, there are some pieces that capture one's attention well into the new year. The next twelve months has so much to offer: Nicolas Ghesquière's debut at Louis Vuitton and Peter Pilotto X Target, for example. However, in the spirit of reflecting on our pasts, let's take a moment to honor some of this year's outstanding, game-changing pieces. Sure, they don't fit many fashion groupies' budgets, but can't a girl dream? 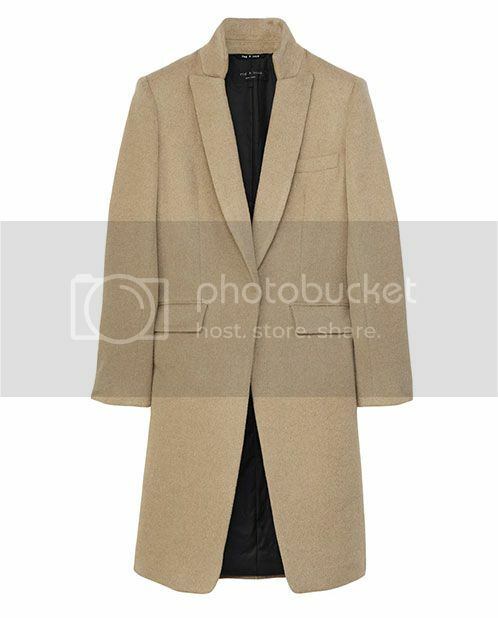 What were some of your favorite pieces from 2013? Sound off below! Whether you're dashing from show to show or examining every look on Style.com, fashion month is the ultimate time for style savants to gush over the latest silhouettes, most delicious fabrics, and best emerging trends. But after thousands of looks, which have obviously been curated in your fashion-forward Pinterest boards, it's hard to remember every pleat, trouser, and shoe that sashays down the catwalk. However, there are some runway ready ensembles that are so ingrained into your memory that you can't get them out of your head. In no particular order, here are the top 13 looks that will inspire me well into 2014. Proenza Schouler Spring 2014 RTW, Look 21: I dare you to tell me you don't adore everything that Lorenzo Hernandez and Jack McCollough design. You can't, right? Exactly. The Parsons classmates turned Proenza Schouler masterminds always deliver perfectly au courant pieces. While their entire spring collection was to die for, I have a (not-so) healthy obsession with the finale looks. 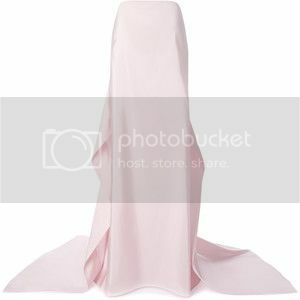 A cross bodice with metallic pleats? Perfection. What I love so much about this look is that it's unapologetically now and anyone who has a penchant for divine threads will adore this. Lauren Santo Domingo was spotted rocking a similar look from the spring collection as was Rooney Mara. And with the help of any secret admirer with endless connections and cash, I will also happily wear this look. But in cream, please. Wouldn't this make for the perfect New Year's Eve ensemble? Belstaff Pre-Fall 2014, Look 16: Bells and whistles asides, it's always comforting to see something on the runway that not only you would wear on a daily basis, but you can also copy with the clothes you already own. For me, this ensemble hit the nail on the head. Head to toe, I love this look so much that I can envision myself wearing it any day of the week (if weather permits). Belstaff has come such a long way since its waterproof jacket days, and I sincerely admire designers who can still make fashion upscale, yet accessible, to the masses. Brava! Chloé Fall 2013 RTW, Look 3: I've been something of a cape fanatic for a couple years now. It all started with a short purple cape that I sported on my very first trip to London. In no time, my mere fascination accelerated into an obsession. Whether it was a black cape from a local boutique or a plaid cape on Brick Lane, I became so enamored with the feminine, yet powerful, image that capes brought. Isn't it about time Olivia Pope wears capes on the daily? 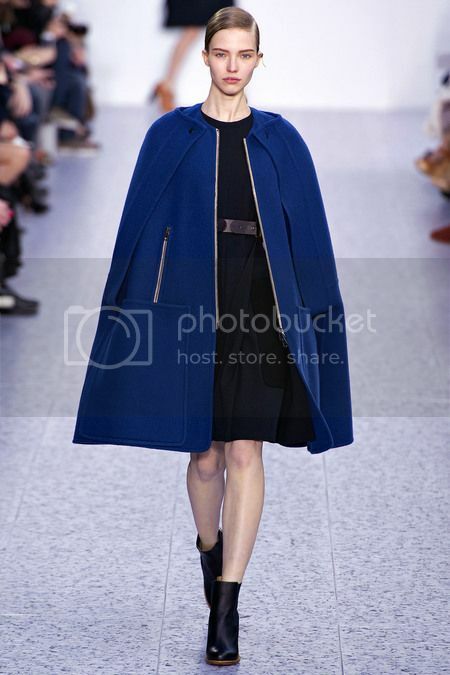 A vibrant blue that stands out amongst a sea of black, this cape caught my eye months ago. When I saw it in person this summer, my feelings only increased. 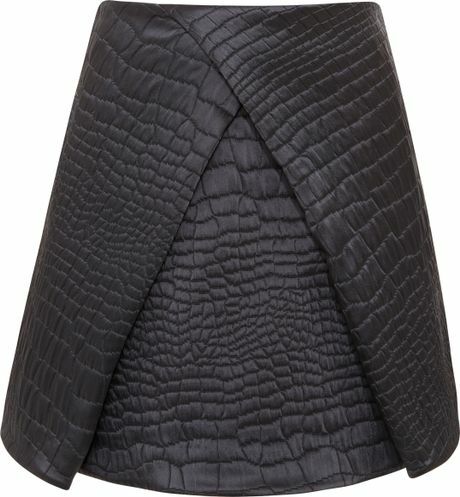 Paired with a sleek black dress and versatile boots, this look best exemplifies how to wear a cape without looking like an old maid. 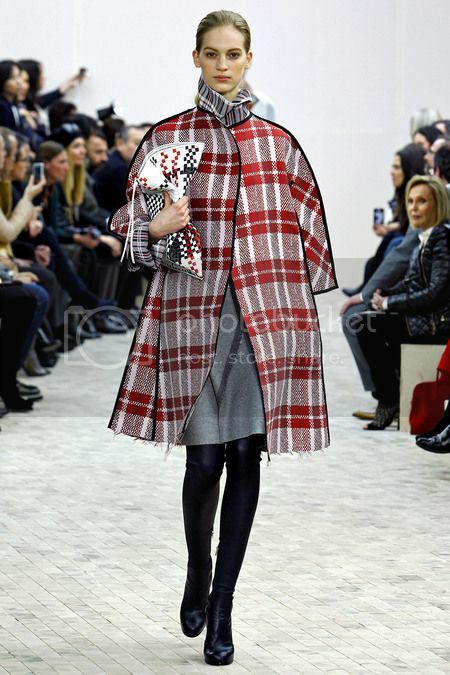 Céline Fall 2013 RTW, Look 25: In case you didn't receive the memo, plaid was very big this fall. From Saint Laurent to Moschino, everyone was giving this lumberjack print a very chic makeover. 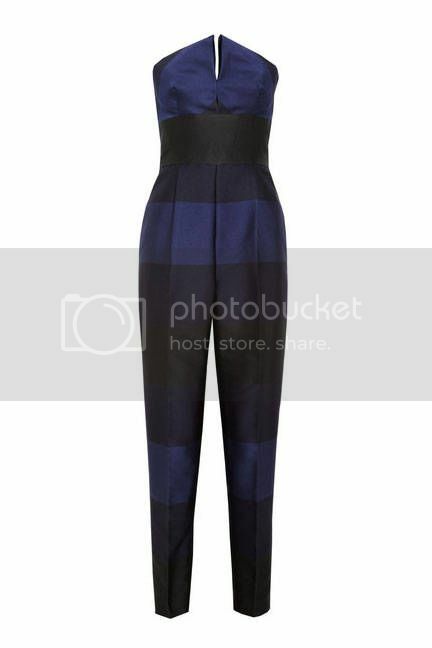 Without a doubt, my favorite example of this trend was Céline's luxe tartan pieces. The traditional silhouette was paired with checks that gave us a new way to look at plaid. Phoebe Philo's heavy emphasis on the white lines offered a dash of minimalist modernity. The otherwise neutral ensemble made this a look that anyone could wear. It's perfect for the ambitious career woman, the Park Avenue housewife who is stopping by the latest PTA meeting before going out to eat, and even that downtown gal who's forced to go to an uptown gala. Try imagining yourself in this outfit. I promise you'll like what you see. Preen by Thornton Bregazzi Spring 2014 RTW, Look 17: On a day-to-day basis, what fashionista doesn't want to wear an effortlessly chic ensemble? Exactly. No fuss, just fashion. I adore this look because it's the perfect way to get a high-octane impact without trying too hard. Whether you're going to work or a coffee date, this ensemble is the ideal way to tell onlookers that you're up to date with trends but don't need to flaunt them. Christian Dior Spring 2014 RTW, Look 58: At first, it was an alarming combination: Raf Simons and Christian Dior. While the former is synonymous with pure minimalism, style spectators always know that Dior will provide feminine ensembles with a modern twist. Would Simons give the design house yet another New Look? 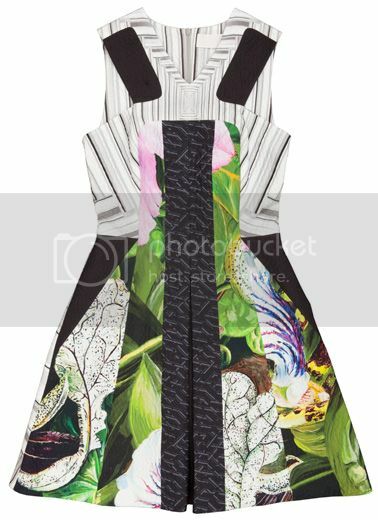 While Simons has a perspective that is very different from his predecessor, John Galliano, his designs have yet to disappoint me. While his latest spring collection seemed promising, it wasn't until the slew of jacquard dresses that I knew I was in love. 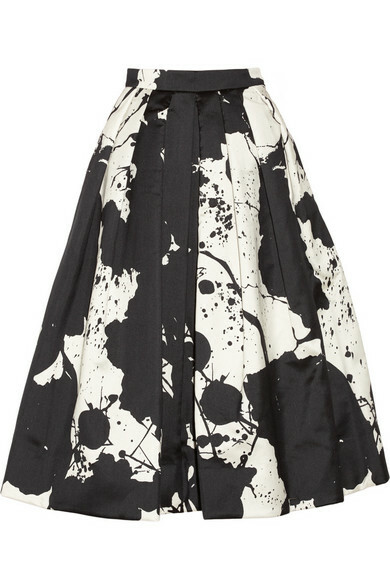 A far cry from Simons's usual aesthetic, this dress revived Christian Dior's flouncy reputation while keeping it updated. 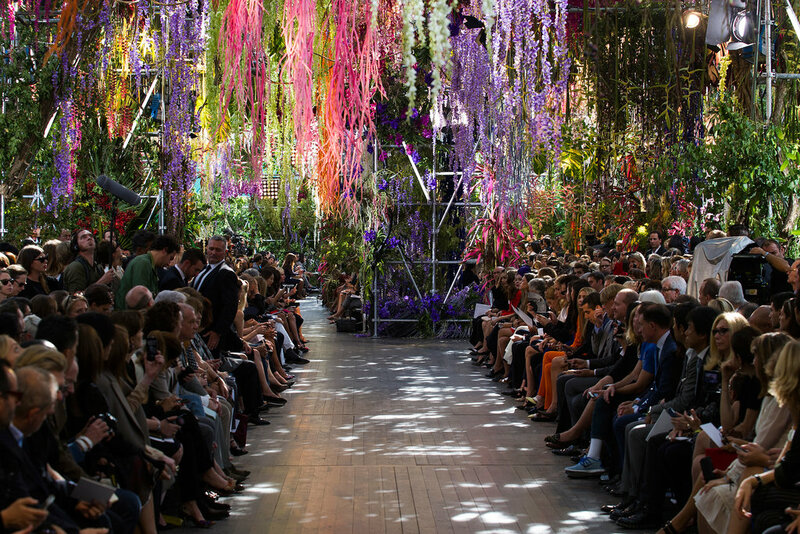 Raf, you had me at the floral ambiance. Tibi Spring 2014 RTW, Look 10: Over the past few seasons, I've had the pleasure of watching Tibi turn into a premier American brand. While Tibi used to be the go-to line for flirty tea dresses and fun prints, I love the sportswear direction Amy Smilovic has taken. 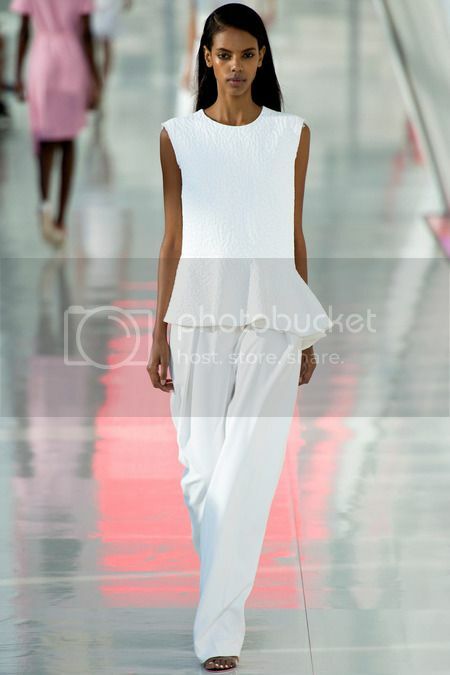 Without a doubt, the spring collection was my favorite Tibi show thus far. With a nature loving theme, I adore how this look channels street style modernity through a very "back to the basics" lens. If you give me an easy one-piece, I'll be happy; however, Smilovic's use of contrasting fabrics and accessories made this one look I will never forget. 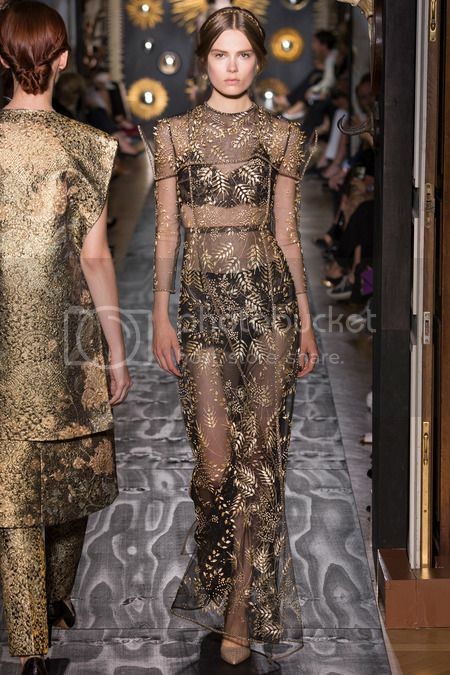 Valentino Fall 2013 Couture, Look 47: Out of all the official couture design houses, Valentino always amazes me with its hypnotizing patterns, bevy of slim-fitting silhouettes, and all-around regal air. 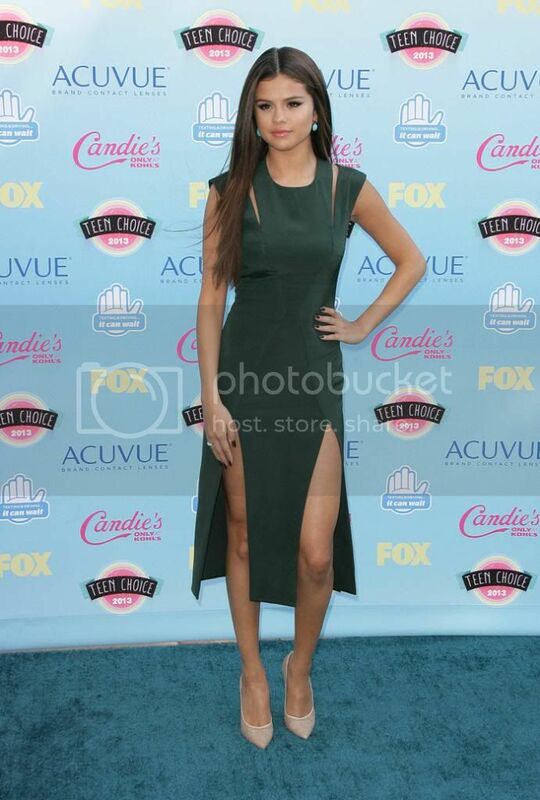 Everything about this dress screams "Dainty Princess." Even though it is entirely sheer, the modest undergarments prevent an outlandishly sultry moment. It's one of the looks that is so special, it should probably be in an everything-proof vault or framed. Thank you, Pierpaolo Piccioli and Maria Grazia Chiuri, thank you very much. Carven Fall 2013 RTW, Look 25: Fall was the season of the coat. 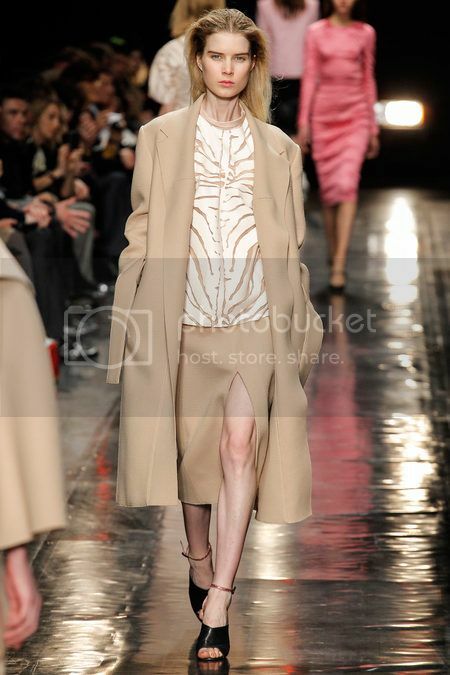 Though Carven featured gorgeous coats in dreamy pastels, this camel look is my favorite by far. There's something so standard about a camel ensemble; however, I strongly believe this hue is one of the most underestimated neutrals around. I love how this look is so sleek, yet the light pink and tan cracked top makes this more than another minimalist ensemble. Plus, those shoes are just divine! Dries Van Noten Spring 2014 RTW, Look 47: To be perfectly honest, it's impossible to categorize your style into one overarching adjective. 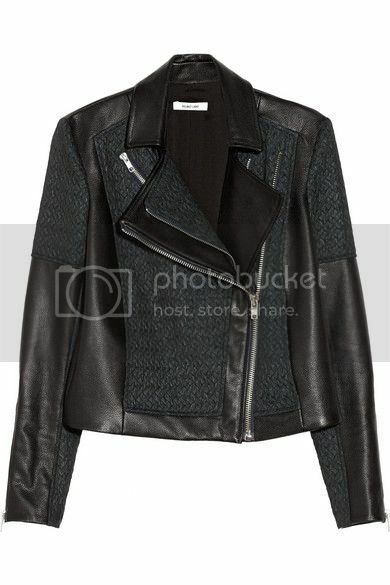 You consider yourself "girly" until you swoon over a tough Balenciaga leather jacket. You're "classic" until you take a look at Prada's latest spring collection. And you're "minimalist" until you fall head over heels in love with Dries Van Noten's spring ruffles and dramatics pleats. I adore a clean, tailored ensemble; however, this look gives a neat look a frilly edge. Of course, you could never wear this look to the grocery store, however, Dries Van Noten gifts us with a relatively somber silhouette that doesn't compromise his extravagant collection. The long shorts are very Calvin Klein sleek while the top is reminiscent of something you would normally sport at the couture shows. The result? An outfit that deserves a standing ovation. girly and current. I would like one of everything, please. Altuzarra Spring 2014 RTW, Look 29: If Joseph Altuzarra's spring collection wasn't the most buzzed about New York collection, I don't know what was. Between the swarm of languid skirts and show-stopping metallics, this group of looks demand your undivided attention. I love this look because it combines the two focal trends from Altuzarra's collection without being too abrasive. To keep the attention on the gorgeous clothes, Altuzarra finishes this look with a pair of simple pumps. 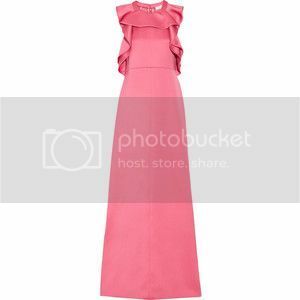 From date night to a charity gala, this look is the ultimate ensemble for any city's "It Girl." 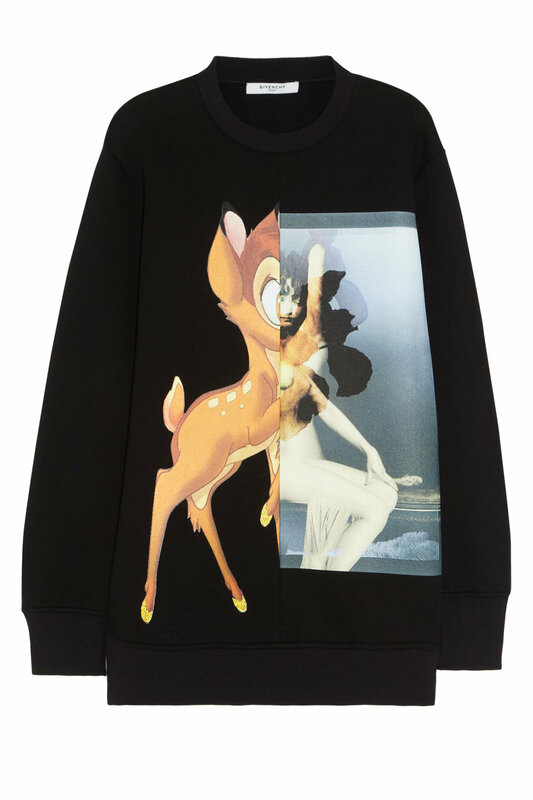 mélange of Wang's cutting-edge aesthetic and Balenciaga's high expectations. Old and new come together with this look: the silhouette is quite traditional, but sheer skirt mixed with the embellished dress bring something new to the table. J'adore! Which runway looks did you love this year? Sound off below! Awards season is coming, awards season is coming! For movie buffs, it's the perfect time to essentially live at your movie theater and analyze each critically acclaimed contender. If you are a complete fashion nerd, these next few months allow you to geek out over red carpet dresses. "Of course she'd wear the Elie Saab" and "Delpozo, why are you so beautiful?" are just two things style savants are bound to say. But in the (not-so) rare event you have a thing for both movies and fashion (a la yours truly), Awards season is the perfect time to do all the fun, aforementioned activities and gush over the on-screen ensembles. 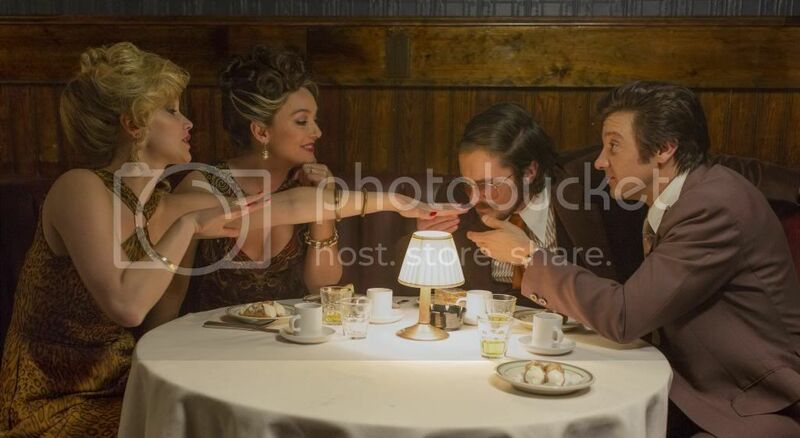 In case you don't keep up with nominated films, let me give you a quick lesson: American Hustle is one of the most buzzed about movies of the season. With an all-star cast-- Christian Bale, Amy Adams, Bradley Cooper, and Jennifer Lawrence-- Silver Linings Playbook genius David O. Russell as director, and a criminal plot that is too juicy to ignore, don't be surprised if this flick takes home a slew of statues this season. But unlike many cinema groupies, I have an additional appreciation for the movie: the clothes. Amy Adam's Sydney Prosser is dressed to the nines in Diane von Furstenberg wrap dresses, sultry low-necked frocks, and even some dangerously crimped hair. On the other sartorial hand, Jennifer Lawrence's Rosalyn Rosenfeld wears everything from salacious white dresses, to Real Housewife worthy track suits, to eccentric fur, to retro prints. I know what you're thinking, pure bliss. "Wait a second," you say as your inner fashion nerd rears its oh-so glamorous head. "A seventies revival sounds all too familiar." You are right ladies and gent. If you recall, seventies chic was all the rage amongst top cruise collections. While Gucci brought a healthy dosage of shimmer and lengthy hemlines, Louis Vuitton returned retro glam to the average working woman. 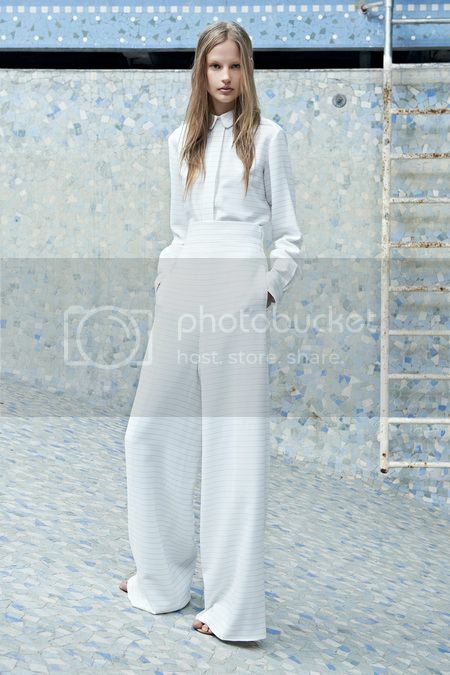 Let's not forget that Emilio Pucci's cruise collection boasted the perfect printed maxi dress and Chloé's Claire Waight Keller successfully infused retro trousers into a very nautical presentation. Is it just me, or are you also yearning for some very groovy time travel? Luckily, we don't need to resort to the Saturday Night Fever days to unleash our inner disco queens (or kings). With a few styling tips (and some swinging pieces), you can rock a look that is equal parts modern and seventies-inspired. You heard it from Rachel Zoe, and you saw it in Austin Powers in Goldmember, gold lamé is the perfect way to revisit the gilded decade sans time machine. 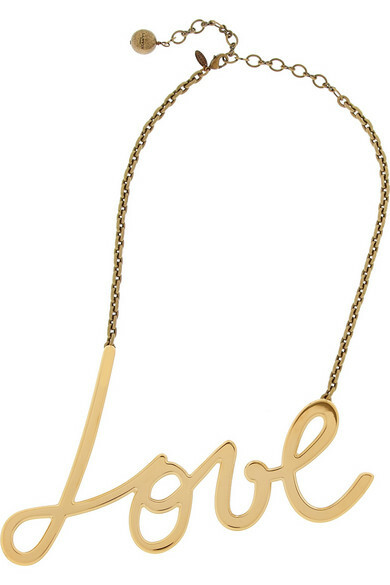 Don't have any gold lamé stored in your closet, and that Lanvin gold dress doesn't fit into your shopping budget? Opt for a shimmery gold dress. Add some spice to this look with silver accessories. Yes, style savant, it's okay to clash your metallics. As for your beauty routine, save the bold lip for a less extravagant ensemble. Complete this look with a messy updo and a slight smokey eye. During this style era, women wore the pants. Paying homage to the great Katharine Hepburn, this decade was the time to sport your high-waisted trousers. Revitalize this fad with a voluminous top in a neutral hue. Not only does this look give a nod to the days when Jane Birkin and Bianca Jagger ruled the world, it's bound to make any street style photographer swoon. As a finishing touch, platform sandals will complete this look and elongate your legs. Unlike the previous look, this outfit is perfect for a colored lip. Nars's Pigalle shade is perfect--it gives your pout a little punch without pushing the envelope. 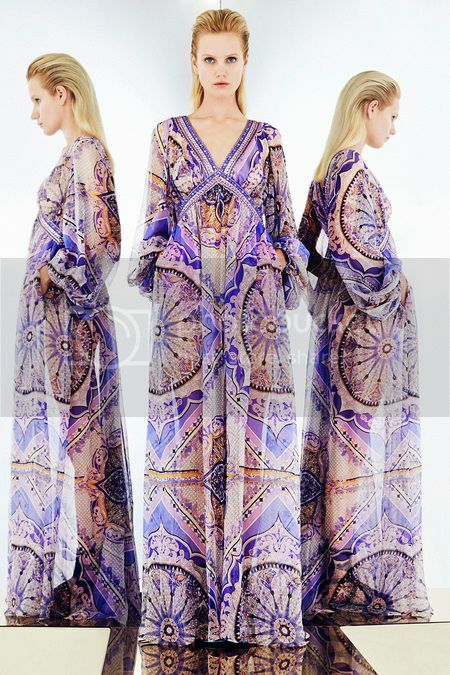 As any fashion groupie knows, Diane von Furstenberg's famous wrap dresses are the epitome of seventies chic. 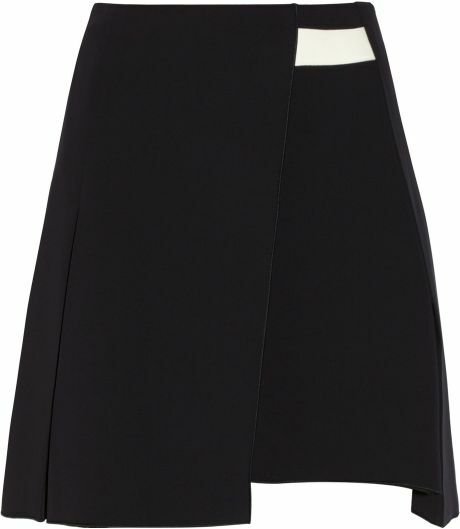 Channel your inner working girl by pairing this frock with some polished accessories. To give this look a seventies savvy twist, add a pair of gold hoops- very stylish! Though fur was all the rage during this era, throwing on a (faux) fur jacket is too costumey. Instead, try a wrap jacket with a (faux) fur collar-- you'll get the same results with this classic alternative. What do you think of this seventies revival? Sound off below!